With clients like the Fox Theatre, 14th Street Playhouse, the Balzer Theater at Herren’s and the Southwest Arts Center, we’re always trying to stay ahead of the game when it comes to using helpful tools to increase ticket sales, promote events and ease the ticket purchasing process. With options like “Pick A Seat” interactive maps, “View From Your Seat” photos and a variety of marketing opportunities through Ticket Alternative’s blogs, newsletters and multiple social media accounts, theaters and their customers experience a simple and smooth process from event start to finish. Several of the theaters we work with currently use our “Pick-A-Seat” feature. The interactive, HTML5-based seating charts allow patrons to pick their own seats at a venue, based on availability. The service can easily be turned on and off as needed. Typically, the feature is available after a busy on sale has passed. Studies have shown that a customer is more likely to purchase a ticket when given the opportunity to choose where they sit. When patrons have the opportunity to pick their own seat they feel like they are getting a more personalized experience. They become familiar with your venue and they enjoy having control in the seat selection process. It creates a level of comfort for new patrons and returning customers! This feature is great for venues with reserved seating that includes varied pricing, VIP sections, and ADA seating. Our “View From Your Seat” feature goes hand in hand with our “Pick A Seat” feature. The “View From Your Seat” option allows customers to view photos of the inside of the theater and the seats they have chosen in relation to the stage. This feature helps to reassure customers that they’ll have a great view of the stage from the seats they’ve chosen. 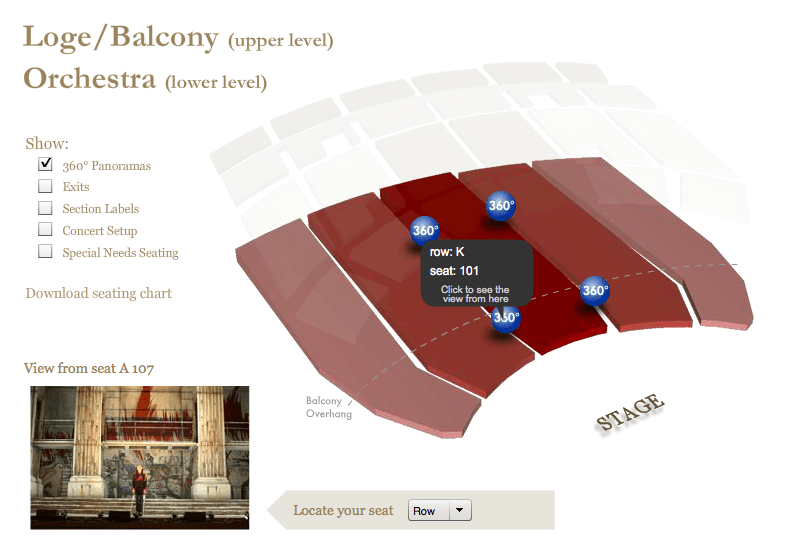 It also allows ticket buyers to see what seats and angles of the theater provide the best view of the stage. If your theater has seats with limited visibility of the stage, it’s always great to provide pictures for these as well so customers fully understand and see what “limited visibility” means. Not only do we offer interactive maps, seating charts and photos throughout the ticket purchasing process, but we also have an in-house marketing team that works with each of our clients to help expand ticket sales and reach new customers. Whether it’s adding your event to our email newsletters, working with us to create a customized marketing campaign utilizing special offers and promo codes, managing your SEO to boost event visibility in search engine results or blogging about your event on TALive.com or AtlantaMusicGuide.com, we’ve got our clients’ marketing needs covered! For more information about our ticketing solutions and marketing tools for your venue and/or event, please contact us.